AWS containers are growing rapidly in popularity but how to secure containers in production is still a new topic. In this video from AWS re:Invent Henrik Johansson and Michael Capicotto present how to secure containers on AWS and use AWS ECS for security and governance. We also provide a summary below. Containers have had an incredibly large adoption rate since Docker was launched, especially from the developer community, as it provides an easy way to package, ship, and run applications. Securing your container-based application is now becoming a critical issue as applications move from development into production. In this session, you learn ways to implement storing secrets, distributing AWS privileges using IAM roles, protecting your container-based applications with vulnerability scans of container images, and incorporating automated checks into your continuous delivery workflow. Container Security Best Practices. Although containers are not as mature from a security and isolation perspective as VMs, they can be more secure by default. Use built-in ECS security options such as SELinux support. Container Lifecycle Security. 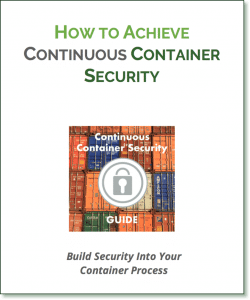 Build in security throughout the lifecycle of containers, from development to build and test to production. Build security into the entire CI/CD process including runtime. Managing Secrets. Be careful about embedding secrets into images or environment variables which are visible from many places. Use third party secrets management solutions or build your own using S3. Use the new IAM roles definition to isolate credentials and authorization between tasks. Using Containers to Automate Security Deployments. Governance can be achieved during continuous integration, by enabling the security teams to deploy security containers as part of the process. Allow security teams to deploy security without having to bake it into the application image. The benefit of being able to integrate security into the CI/CD process is that accidental conflicts are removed, developers and security teams can operate independently, and controls are more logically defined and enforced. NeuVector provides an application and network aware container security solution which you can easily test drive and deploy, even on running applications.